Sleek and sophisticated design offers premium protection for your laptop while providing feature rich compartments to accommodate all of your accessories including room for an overnight stay of clothing or a secondary device. Laptop protection is made out of a high density EVA that will offer state of the art protection. Luxe Rolling case is designed to fit laptops up to 15.6-inch. 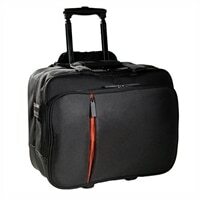 Rolling case offers an expandable file section with room for a second laptop or a portable printer/projector. Also features a water bottle holder along with a retractable luggage tag holder plus 2 removable accessory pouches. Plush interior lining protects devices from scratching and exterior has a convenient pass through strap to allow the Luxe Rolling Case to easily attach to another case. Designed to accommodate laptops up to 15.6"